Teflon® coated pan on a Whirlpool Gold Electric Range. Test conducted on May 13, 2003 by Environmental Working Group. A 10" diameter aluminum Europa Basic Essential Everyday pan with a Non-stick Teflon® Classic interior was placed on the burner of a Whirlpool Gold electric range top. 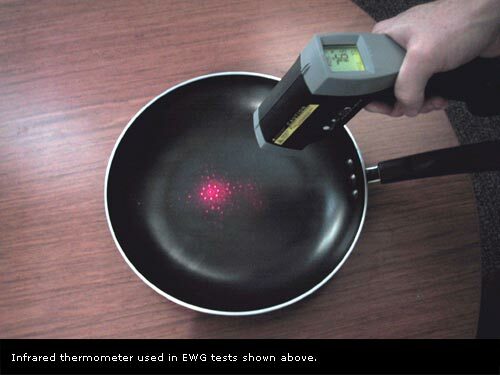 At time = 0 seconds, the pan temperature measured 73.5°F. The burner was turned up to the highest heat setting, and a timer was started. Using a Raytek Infrared Model Raynger ST Pro noncontact thermometer with an accuracy of +/- 2°F, the temperature was monitored every twenty seconds for 300 seconds (5 minutes). In this period of time, the temperature of the pan reached 721°F. At this point the pan was removed from the burner and the burner was turned off. The smell of burning plastic was noted. Non-stick coated pan on a Tappan Electric Range. Test conducted on May 12, 2002 by a university food safety lab scientist. A 10" diameter aluminum skillet from Dollar General was placed on the burner of a Tappan electric range top. At time = 0 seconds, the pan temperature measured 72°F. The burner was turned up to the highest heat setting, and the timer was started. 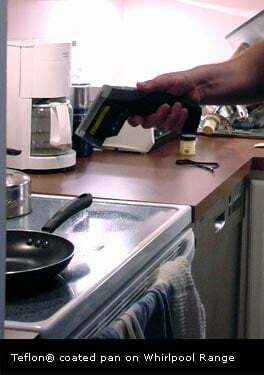 Using a Raytek Infrared Model Raynger ST noncontact thermometer with an accuracy of +/- 2°F, the temperature was monitored by scanning the thermometer back and forth within the pan to obtain an average temperature reading; this was done every twenty seconds for 200 seconds (3 minutes and 20 seconds). In this period of time, the temperature of the pan reached a maximum of 754°F, and an average pan temperature of 736°F. The temperature was still rapidly climbing. At this point the pan was removed from the burner and the burner was turned off. A small line of changed color in the interior of the pan was noted. Non-stick coated pan on a Kenmore Natural Gas Range. Test conducted on May 12, 2002 by a university food Safety lab scientist. A 10" diameter aluminum skillet from Dollar General was placed on the burner of a Kenmore natural gas range top. At time = 0 seconds, the pan temperature measured 77°F. The burner was turned up to the highest heat setting, and a timer was started. Using a Raytek Infrared Model Raynger ST noncontact thermometer with an accuracy of +/- 2°F, the temperature was monitored every twenty seconds for 300 seconds (5 minutes). In this period of time, the temperature of the pan reached 664°F. At this point the pan was removed from the burner and the burner was turned off. A scent of “residual processing oils” was noted.